My life is governed by the Imperative of Protein. Rare is the week when there is not some sort of freshly killed meat in our house. Even now a small flock of ducks lies motionless in my refrigerator. 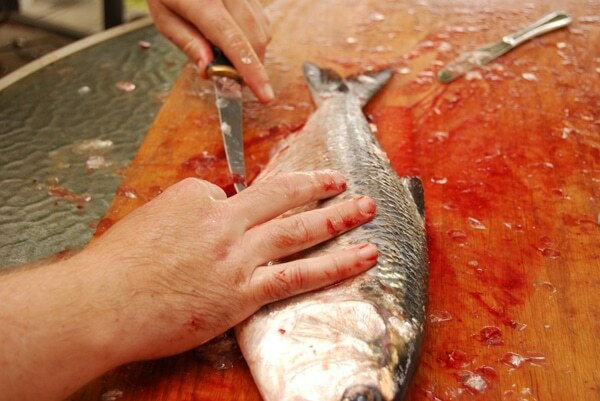 Next week it might be herring from the San Francisco Bay; the week after it could be geese. Or sturgeon. In late spring, there’s usually a wild boar to butcher. In summer, an endless school of fish. Autumn brings deer and bear and maybe even an elk or moose. The cycle never ends. As soul-satisfying as it is to be self-sufficient in protein — I can count on one hand the times we have bought meat for our house since 2004 — such a lifestyle requires commitment. Ducks do not pluck themselves, nor do fish shed their scales. And deer do not magically explode into roasts and steaks and shanks. All of this requires work. Most hunters and almost all anglers know what I am talking about. The rapture of slamming a limit of shad or a giant keeper sturgeon is soon tempered by the realization that long hours of scaling, gutting and filleting lie ahead. And every deer hunter, flushed with the joy of bringing down a big buck or a fat doe, has had his bubble broken by someone pointing out that “now the work begins.” Farmers understand this too, on a much larger scale. “Chicken Killing Day” can involve scores of birds and a full day’s labor. Hog-killing requires so much labor that in very culture that eats pork it has been enshrined as a day of work — and celebration. The vast majority of Americans, Canadians, Australians and Europeans have no idea what it is to live like this. If you buy your meat at supermarkets, shrink-wrapped and already cut into pieces ready for the pan, meat for you is just something to cook; you get it at the last stage in the process. Even those who buy their meat from small farmers often have to do little more than cut a chicken or rabbit into its constituent parts. This is not altogether a bad thing. Having others process their meat absolves people from the Imperative of Protein. Holly and I spend long hours plucking, skinning and butchering fish and game, hours that could be spent on useful work elsewhere. But having others do the dirty work of processing meat also divorces people from the reality of where their protein comes from — and, most disturbingly, engenders a sentiment that those of us who face that reality are barbarians, Neanderthals who revel in the blood crusted under our fingernails. A few months ago I was on the road, tired, buying a bottle of water at a convenience store in Ohio. 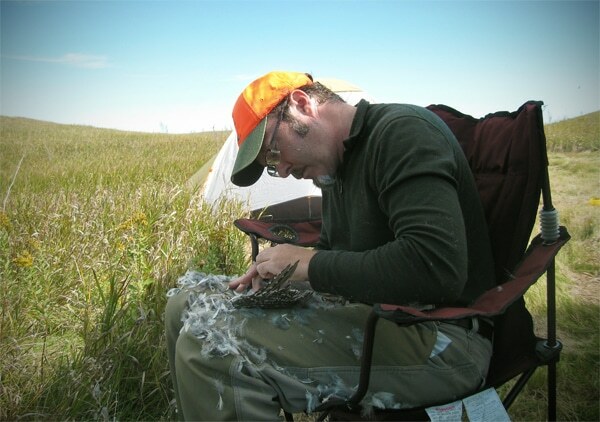 I was wearing a Delta Waterfowl hat, which happens to be camouflage. “Are you a hunter,” asked the woman standing in line behind me. I should have detected her tone, but like I said, I was tired. Yeah, I am. “That’s disgusting,” she responded, her voice rising. “How can you kill those poor fish and deer and ducks. You must love blood.” I should have just walked away. But I didn’t. Instead, I asked her if she was a vegetarian. “Of course not. I buy my meat in the supermarket, like everyone else.” This time I did walk away. There is no reasoning with some people. Even vegetarians understand that on planet Earth, life requires life. Those who choose not to eat meat are indeed trying to take a different path, and that’s fine — although that path, too, is not without cost to the animal kingdom. I have no quarrel with vegetarians. But one of my dearest hopes is that there is a special place in Purgatory for those who will happily stuff their maws with ground-up old dairy cows and then turn around and call me a monster for facing a reality they dare not. Thankfully, in recent years exchanges like the one in the Ohio convenience store have become more rare. The Cellophane People are either changing their ways, or are realizing that they are clinging to a fantasy and are keeping quiet. More and more I hear curiosity, not disgust, in the voices of the Cellophane People. A few want to know how I do what I do. Most, however, just want to know why: They have no intention of ever ordering sides of pork or buying whole chickens, but they’re curious about why someone else would want to do that. It’s not about meat per se. If you think about it, while I live under the Imperative of Protein, a vegetarian lives under an equally strong imperative. After all, a vegetable, unlike a fruit, comes from a part of a plant that did not want to be eaten. Stalks, leaves, roots — most vegetables require processing to become food, just as animals do — sometimes processing that is just as intense. I do what I do because I choose to. I chose to acquire the skills to process and butcher animals and fish, and I continually choose to exercise those skills. I would rather spend two hours plucking and gutting ducks than sitting in front of the television playing “Halo.” I would rather hone a deep understanding of the intricacies of deer anatomy than mow the lawn. Yes, processing your own meat and fish saves money, and it does open up huge vistas of opportunity for the cook: Think stocks and broths, giblets and charcuterie. But at its core, I choose to live under the Imperative of Protein because it requires me to understand — and accept — the full karmic cost of eating meat. Every time I shoot a deer or hook a salmon, I watch, at close range, that animal go from individual to corpse to carcass to cut of meat. It is sobering. And necessary. Some say everyone who eats meat ought to be required to butcher it at least once. A fine, if utopian, idea. Such a requirement would create a great many vegetarians, but it would also create a public far more in touch with it eats. North Americans, particularly, would benefit from this. But like I said, such a requirement is utopian. There is a way at least to approach what’s like to live under the Imperative of Protein: Buy whole chickens or rabbits, and break them down yourself. Is it the same as killing, plucking and gutting one? No. But even the baby step of taking a knife to a whole bird will at least force you to understand that this was once a living, clucking, walking chicken. That, I think, is not too much to ask. 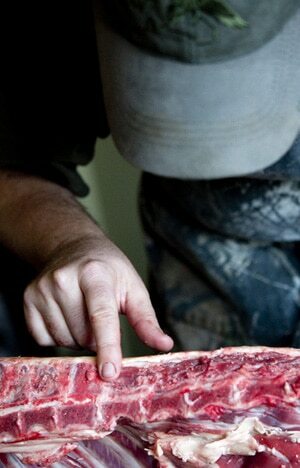 Hunting, fishing and processing your own meat makes you respect where it comes from. You are less apt to let it go bad in the fridge when you know that a life was given for this. Bravo for your remarks. My only problem with hunting is that it is not cheap in Washington. I fish a lot, clam etc. I try to buy the rest of my meat on the hoof, even though I do not process it, I understand where my meat comes from and respect what was given by the animal. I also know that the animal was treated with respect until it was butchered. It is hard to get other meat eaters to stop buying meat that was raised in feed lots. And that woman said you were disgusting. beautiful piece and I couldn’t agree more with most of what was said. 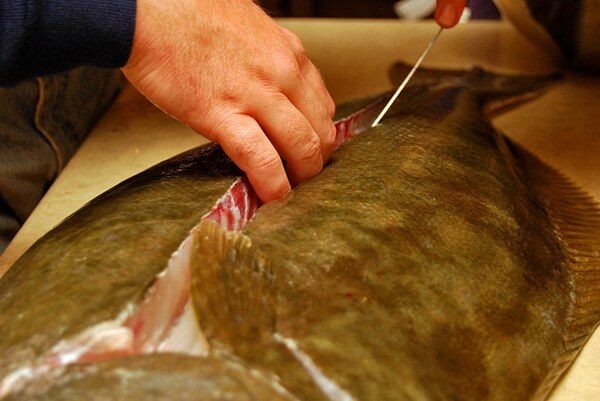 I have been an angler my entire life and also done my fair share of skinning and plucking. I have found the process of preparing my harvest to be one of the most honest and truthful ways of becoming closer to what you eat. With that said I have also found that it causes me to eat less meat and appreciate and respect it more when I do. I feel it needs to be said that if we all were to stock our fridge with a “small flock of ducks” and exist entirely off the land while eating meat almost everyday our forests and lakes would be empty. I truly envy your lifestyle but please don’t romanticize it too much Hank! The day hunting becomes “trendy” and we all take to the woods it might be disastrously unsustainable. I agree entirely Hank. Nicely worded. I didn’t grow up in a family that hunted, fished (for food), or foraged. My grandparents did farm and grew most of the produce they ate. I developed a love of the outdoors as a child and adolescent and it was that love that drew me toward hunting, fishing, and foraging. I have always had a love of farming. 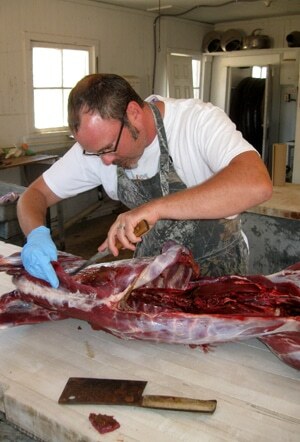 I usually manage to kill two or three deer a year, process them myself, and put them in the freezer. We also can some of the meat. We use nearly everything. We have friends who raise hogs and I help slaughter and process hogs the same weekend in December every year. We buy half a hog and put it in the freezer ourselves. We make our own sausage. I usually put some squirrels and rabbits in the freezer during the season as well, and once bought a live turkey and chicken to self-process for our Thanksgiving meal. That was a fantastic meal! We fish a good bit during the summer and we eat what we catch. We have put fish into jars. We grow a lot of the vegetables we eat. We can and freeze the harvest for the winter. We do this because we believe it is important to be connected to the food we eat, and we consciously resist what we believe is a vanishing culture of self reliance. It does take a lot of time, time we could spend doing other things. I would not trade the invested harvesting and growing our food, for neatly package cuts of meat and individually shrink wrapped cucumbers. Nice read. Nice to see all the agreeable responses. When I spend my time to hunt it, quarter it, de-bone it, wrap it, freeze it and THEN cook it…I have respect for my food and the life that it was.